The edifice of an Islamic civilization can only be erected if its values are rooted in the teachings of the Qur’an, and the objectives of the Sunnah and Sirah of the noble Messenger of Allah (SAW). No committed Muslim would disagree but the question of how we go about rebuilding it is not as straightforward as it may sound. The Qur’an must be studied in much greater depth than what most Muslims are used to doing at present: reading it merely for the undoubted blessings it brings. We must study the Qur’an to derive lessons for the arduous struggle in life. As the eternal Word of Allah (SWT) is thoughtfully engaged, it yields ever deeper insights. Our understanding is also influenced by the peculiar circumstances of the contemporary situation. This is not to suggest (nastaghfirallah) that its laws are not immutable or permanent but to emphasize the fact that certain aspects compared to others emerge with greater clarity depending on the requirements of each generation. We live in difficult, troubled, and unsettled times; Muslims are under attack almost everywhere. They are struggling to confront these challenges with varying degrees of success. How the Muslim response can be made more effective is a question we must address. And to guide the fulfillment of our weighty responsibility on earth, the Qur’an and the Prophet’s (SAW) Sunnah and Sirah are the essential milestones for our journey. He it is who has sent forth His Apostle with the [task of spreading] guidance and the din of truth, to the end that He may cause it to prevail over all [false] systems of life — however hateful this may be to those who ascribe divinity/authority to any beside Allah (9:33; 61:09). The noble Messenger of Allah (SAW) made Islam dominant in a society that was steeped in jahiliya. He brought his people out of darkness within the short period of 23 years. The Arabians who had prided on their primitive savagery by indulging in pillage and murder became the most upright, honest, and inspiring people on earth. By following closely the teachings of the Qur’an, they established a powerful civilization that lasted nearly 1,000 years despite the gradual estrangement of their representative political mechanisms away from the pristine purity of Islam’s teachings after the death of the Prophet (SAW). Successive generations of Muslims have struggled to reassert the power of Islam. This is a challenge Muslims have faced in every generation. How we reassert the power of Islam once again will depend on the clarity of our thought and the level of our commitment. The prerequisite for this is a much clearer understanding of the noble Book. 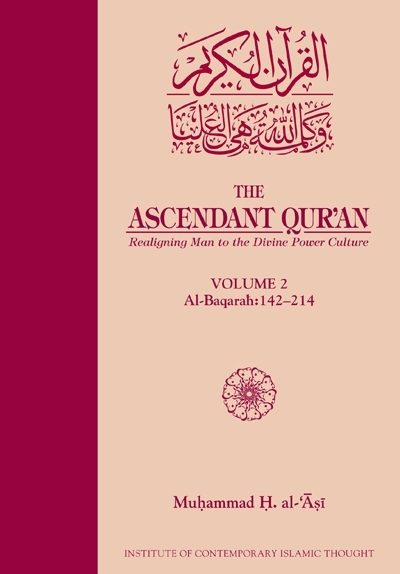 Imam Muhammad al-'Asi’s tafsir, The Ascendant Qur’an: Realigning Man to the Divine Power Culture, seeks to achieve just that. It aims to broaden our understanding of the divine message by resuscitating within us the criterion quality of the Qur’an so that we can measure the wayward world around us according to an immutable reference point. By sustaining Qur’anic references with their modern personifications and contemporary circumstances, this work enables us to begin to apply valuable lessons both in our individual as well as collective lives, thereby bringing us into conformity with Allah’s (SWT) commands in a seemingly impossible situation. We are grateful to Allah (SWT) for His Mercy and Grace in helping us spread His message in a way that English-speaking Muslims can relate to in their daily lives. One of the most widely heard comments after the first volume of this tafsir was published in Jumada al-Ula 1429 AH (2008 CE) was: how soon will the other volumes follow? This second volume and subsequent volumes to come out soon, insha’ Allah, address this question. Several reasons may have prompted this question. An important one is our own indication that there would be at least 20 volumes of this tafsir to cover the entire Qur’an. We hope those that asked about subsequent volumes were anxious to get them as soon as possible since the first volume helped explain the meanings of the noble Book in a way that made its message relate directly to our contemporary situation. Many misconceptions that may have crept into the meaning of the Qur’an as a result of poor translation or the inappropriate choice of suitable English words have been clarified by Imam al-'Asi to eliminate ambiguity; many other concepts will, insha’ Allah become clearer as subsequent volumes are published. There may perhaps have been other reasons as well but we need not delve into them. For us the most important task is to produce succeeding volumes as quickly as possible so that Muslims eager to engage the noble Book can do so secure in the knowledge that the work is progressing satisfactorily. Initially we had calculated that the remainder of Surah al- Baqarah (ayat 142–286) would be covered in the second volume. When the material was put together it became clear that a single volume would become too bulky. We therefore decided to publish the rest of Surah al-Baqarah in two volumes with Volume 2 covering ayat 142–214 and Volume 3, the balance from ayat 215–286. This has resulted in making each of the three volumes thus far completed of about equal size. We have deliberately avoided following the juz’ pattern since such a division while convenient for the purpose of recitation — such as during the month of Ramadan, in which the well-known 30 juz’s are recited during the tarawih congregation — does not easily lend itself to studying the subject matter of the Qur’an. The Qur’an’s natural arrangement is in surah's, there being 114 in all, ranging in length from three ayat for the shortest surah's, al-Kawthar and an-Nasr, to 286 ayat for the longest surah, al-Baqarah. The word surah is often translated as chapter but secular word choices often limit the Qur’anic lexicon and could lead to confusion. Derived from the noun sur, which means an enclosure or wall, the literal word surah implies something that is self-contained and thus each surah of the Qur’an must be treated as such. Some suras, like the second surah, al-Baqara, are spread over multiple juz’s, and if the tafsir was divided according to the juz’ definition, there would be a danger of losing the surah’s continuity. Most surah's, barring the shorter ones, also deal with multiple themes with ayat grouped together to reflect or explain a particular theme. These themes often carry over from one juz’ to another. In our judgement, therefore, the explanation of themes in the original surah format of the Qur’an is a more suitable way to understand the meanings of the noble Book, and understanding is a key issue with this project. This is why Imam al-'Asi has taken a non-traditional approach with this tafsir. In the foreword to the first volume, we had said, “It was in South Africa that the idea of this tafsir was first proposed. The year was 1996 and Crescent International had just held a highly successful international conference on the theme, Creating a New Civilization of Islam… it was [during one of] the informal discussions after formal conference sessions… that some Muslim youth involved in the Qur’an Study Group suggested to Imam al-'Asi to consider writing a [contemporary] tafsir of the Qur’an.” This needs clarification. When the first volume of the tafsir was printed in 2008, associates of the Institute of Contemporary Islamic Thought (ICIT) in South Africa pointed out to this writer that the late Dr. Kalim Siddiqui was intimately involved in the decision to launch the tafsir project 12 years earlier. I was not privy to this information until our discussion on the subject in South Africa last year. Dr. Kalim Siddiqui, already a heart patient who only a few months earlier had undergone a second bypass operation in England, suddenly became quite ill after his return to Pretoria from a trip to Botswana on April 15, 1996. He was due to fly back to London the following evening but doctors advised against travel until his condition stabilized. He was rebooked for April 19th while this writer flew out of Johannesburg on April 16th, heading for Toronto. After a day’s rest and heavy doses of medication, Dr. Siddiqui felt much better. There was a general feeling that he had over-exerted himself and that the rest did him much good. In the few additional days before his new scheduled departure date, Dr. Siddiqui, the ICIT associates, and Imam al-'Asi met to discuss the possibility of working on the tafsir. Dr. Siddiqui asked Imam al-'Asi to undertake the project telling him that he was the most suitable person for this task. Unknown to this writer, an agreement to this effect was concluded and a day later, on April 18, 1996, Dr. Siddiqui suddenly passed away at maghrib time. During those extremely difficult and chaotic days, it was virtually impossible to gather all the information or discuss such matters. We were all consumed by the sudden death of Dr. Siddiqui and became engrossed in dealing with the aftermath of the tragedy. Thus, for the record, it must be stated that it was at the insistence of Dr. Kalim Siddiqui that Imam al-'Asi launched into writing this tafsir that has now, al-hamdu lillah, progressed considerably. Much more could be said about the momentum that was generated by Dr. Siddiqui in establishing the Muslim Institute, in organizing the activities which brought us all together, in providing the intellectual force which laid the foundation for future work, and in creating an open forum in which his and astute Muslims’ political acumen could have a voice. Dr. Siddiqui’s commitment and work, indeed the legacy he has left behind, has been embodied in the publication of The Ascendant Qur’an, and the continued expansion of ICIT’s activities. A lot more needs to be done, however, and as we bring out additional volumes, we are aware that the pressure on us — the mufassir, editors, and publisher — will increase. We pray to Allah (SWT) to enable us to fulfill this task as expeditiously as possible and to His satisfaction. We have stated before (Crescent International, May 2008) that the noble Qur’an cannot be accurately translated into other languages, especially English, since the latter is rooted in a secular culture and value-system and is not adequately equipped to convey the divine message. Thus, an English translation of the Qur’an suffers from both language deficiency as well as space limitation. The meanings inherent in the divine message are so profound that they cannot be adequately or accurately communicated through the medium of the English language. As the divine word of Allah (SWT), the Qur’an’s meanings become clearer as human knowledge expands. Thus, in order to get as close to the divine message as possible, Muslims must have access to a tafsir (exegesis) of the Qur’an. A tafsir not only provides a translation but also sheds light on the circumstances in which the ayat of the Qur’an were revealed providing context to their meaning. Imam al-'Asi does more: he relates the application of Qur’anic ayat to the contemporary situation so that Muslims, as well as non-Muslims, are able to see how the divine message is essential to help us overcome the present bleak situation facing humanity. We are acutely aware of the challenges that confront us and our own limitations in meeting them. We seek Allah’s (SWT) guidance and the help and support of our friends and well-wishers to realize these dreams. A project of this kind cannot be realized without the help and support of a very large number of people. Some we have mentioned; others wish to remain anonymous. We pray to Allah (SWT) to reward all those who have or continue to help with this noble task. Producing a tafsir is only the first step; getting it into the hands of Muslims worldwide is another challenge that we must address before they are able to implement its teachings in their lives. We must all do what is in our capacity and pray to Allah (SWT) to accept these humble efforts from us. Amin. 1. In writing The Ascendant Qur’an, the mufassir, Imam al-'Asi, has formally consulted with up to 22 tafsirs as references from the compendium of previous tafsir literature. One, a few, or all of the following tafsirs, in which the original hadith of the Prophet (SAW) or sayings of other individuals may be found, have been utilized. Imam al-'Asi chose the first five of these because they have captured and consolidated the information in the previously well known tafsirs including al-Tabari, Ibn Kathir, al-Zamakhshari, al-Qurtubi, and al-Razi. Secondly, the combination of these five delved more deeply into ideas that attempted to grasp the full meaning of the Qur’anic discourse. Dr. Wahbah al-Zuhayli, Al-Tafsir al-Munir fi al-‘Aqidai wa al-Shari‘a wa al-Manhaj. (Beirut, Lebanon: Dar al-Fikr al-Mu‘assir, 1411 AH), 1st ed., 32 vol. ‘Allamah Sayyid Muhammad Husayn Tabataba’i, Al-Mizan fi Tafsir al-Qur’an. (Tehran, Islamic Republic of Iran: Dar al-Kutub al-Islamiyah, 1397 AH), 3rd ed., 20 vol. Muhammad al-Tahir ibn ‘Ashur, Al-Tahrir wa al-Tanwir (better known as Tafsir ibn ‘Ashur). (Beirut, Lebanon: Mu’assasah al-Tarikh, 1420 AH), 1st ed., 29 vol. Abu al-Fasl Shahab al-Din al-Sayyid Mahmud al-Alusi al-Baghdadi, Ruh al-Ma‘ani fi Tafsir al-Qur’an al-‘Alim wa al-Sab‘i al-Mathani. (Beirut, Lebanon: Dar al-Fikr, 1414AH), 16 vol. Mustafa al-Hisun al-Mansuri (edited by Muhammad ‘Ali al-Sabuni), Al-Muqtataf min ‘Uyun al-Tafasir. (Damascus, Syria: Dar al-Qalam, 1416AH), 5 vol.